This represents a section on linux, lots of unix variants and some bare metal systems. Definition at line 27 of file MCSectionELF.h. Definition at line 89 of file MCSectionELF.h. Definition at line 86 of file MCSectionELF.h. Definition at line 87 of file MCSectionELF.h. Referenced by llvm::TargetLoweringObjectFileELF::getExplicitSectionGlobal(), isWeak(), and llvm::TargetLoweringObjectFileELF::SelectSectionForGlobal(). Definition at line 73 of file MCSectionELF.h. Definition at line 72 of file MCSectionELF.h. Referenced by llvm::MCELFStreamer::EmitLabel(), isWeak(), and UseCodeAlign(). Definition at line 75 of file MCSectionELF.h. Referenced by GetAEABIUnwindPersonalityName(), llvm::MCObjectFileInfo::getStackSizesSection(), isWeak(), and llvm::MCContext::renameELFSection(). Definition at line 70 of file MCSectionELF.h. Referenced by llvm::BTFDebug::beginFunctionImpl(), GetAEABIUnwindPersonalityName(), isWeak(), PrintSwitchToSection(), and llvm::MCContext::renameELFSection(). Definition at line 71 of file MCSectionELF.h. Referenced by isVirtualSection(), and isWeak(). Definition at line 84 of file MCSectionELF.h. Referenced by GetAEABIUnwindPersonalityName(), and llvm::MCContext::renameELFSection(). Definition at line 83 of file MCSectionELF.h. Referenced by PrintSwitchToSection(), and ShouldOmitSectionDirective(). Definition at line 192 of file MCSectionELF.cpp. Definition at line 53 of file MCSectionELF.cpp. References assert(), llvm::Triple::getArch(), llvm::MCAsmInfo::getCommentString(), llvm::MCSymbol::getName(), getSectionName(), llvm::Triple::hexagon, llvm::Triple::isARM(), llvm::Triple::isThumb(), isUnique(), llvm::MCExpr::print(), printName(), llvm::report_fatal_error(), llvm::ELF::SHF_ALLOC, llvm::ELF::SHF_ARM_PURECODE, llvm::ELF::SHF_EXCLUDE, llvm::ELF::SHF_EXECINSTR, llvm::ELF::SHF_GROUP, llvm::ELF::SHF_HEX_GPREL, llvm::ELF::SHF_LINK_ORDER, llvm::ELF::SHF_MERGE, llvm::ELF::SHF_STRINGS, llvm::ELF::SHF_TLS, llvm::ELF::SHF_WRITE, ShouldOmitSectionDirective(), llvm::ELF::SHT_FINI_ARRAY, llvm::ELF::SHT_INIT_ARRAY, llvm::ELF::SHT_LLVM_CALL_GRAPH_PROFILE, llvm::ELF::SHT_LLVM_LINKER_OPTIONS, llvm::ELF::SHT_LLVM_ODRTAB, llvm::ELF::SHT_MIPS_DWARF, llvm::ELF::SHT_NOBITS, llvm::ELF::SHT_NOTE, llvm::ELF::SHT_PREINIT_ARRAY, llvm::ELF::SHT_PROGBITS, llvm::ELF::SHT_X86_64_UNWIND, llvm::MCAsmInfo::usesSunStyleELFSectionSwitchSyntax(), llvm::Twine::utohexstr(), llvm::Triple::xcore, llvm::ELF::XCORE_SHF_CP_SECTION, and llvm::ELF::XCORE_SHF_DP_SECTION. Definition at line 74 of file MCSectionELF.h. 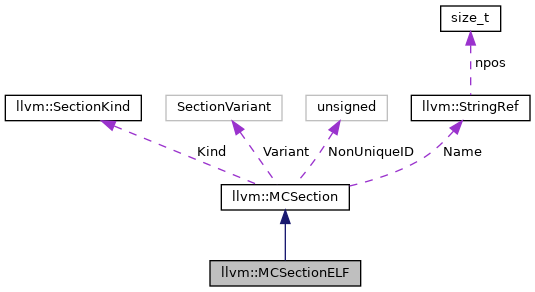 Definition at line 22 of file MCSectionELF.cpp. Definition at line 188 of file MCSectionELF.cpp. Referenced by llvm::MipsTargetELFStreamer::finish(), and getGroup(). Definition at line 51 of file MCSectionELF.h.